20,000 Leagues Under the Sea is a 1954 American Technicolor adventure film and the first science fiction film shot in CinemaScope. The film was personally produced by Walt Disney through Walt Disney Productions, directed by Richard Fleischer, and stars Kirk Douglas, James Mason, Paul Lukas and Peter Lorre. It was also the first feature-length Disney film to be distributed by Buena Vista Distribution. 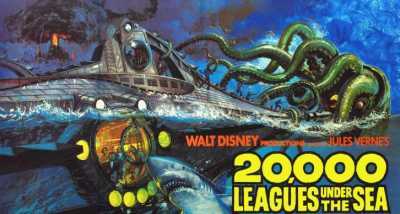 The film is adapted from Jules Verne’s 19th-century novel Twenty Thousand Leagues Under the Sea. It is considered an early precursor of the steampunk genre.